Armando Iannucci’s latest is not the laugh riot you may have been expecting. In many ways, it is as much a dark historical drama as it is the blackest of black comedy. For The Death of Stalin, for all its broad characterisations, and rampagingly inappropriate Yorkshire accents (amongst others), never turns away from the reality of the cruel insanity of life under Stalin’s rule. For every sharply satirical stab at the nature of panic-driven bureaucracy, there is a brutal reminder of Stalin’s lists of those to be killed, visually represented in the casually inconsequential attitude to death. It is this blend that may well stifle some of the laughs, but ultimately becomes the strength of the film. Focusing on Stalin’s last day and the furore in the days that follow it, Iannucci and his team careen through the Soviet Union, focusing on the politicos left behind and their internecine struggle for power. 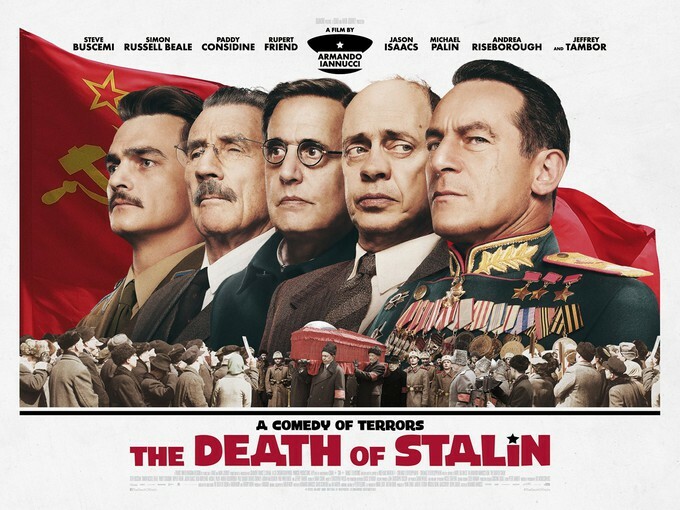 Of course, all of them, from Buscemi’s slimy Nikita Khrushchev, to Isaacs’ General Zhukov, to the welcome sight of Michael Palin’s Molotov to Simon Russell Beale’s vile Beria, are not really sure what power looks like now, or how to grasp it without betraying what may or may no longer be the ideology of mother Russia. This leads to a brilliant boardroom scene towards the centre of the film, that is full of such painful indecision as to be hilariously painful to sit through. For his most formal piece to date – eschewing his customary improvisation and handheld camerawork – Armando has brought together a hugely talented cast – add to the above, Riseborough, Whitehouse, Considine, Tambor and Friend – who all acquit them superbly well. There are many laugh out loud moments - unfortunately too many of them ended up in the trailer which sets a significantly different tone to the movie as a whole. But make no mistake – this is a dark movie more than it is anything else. And more powerful for it.